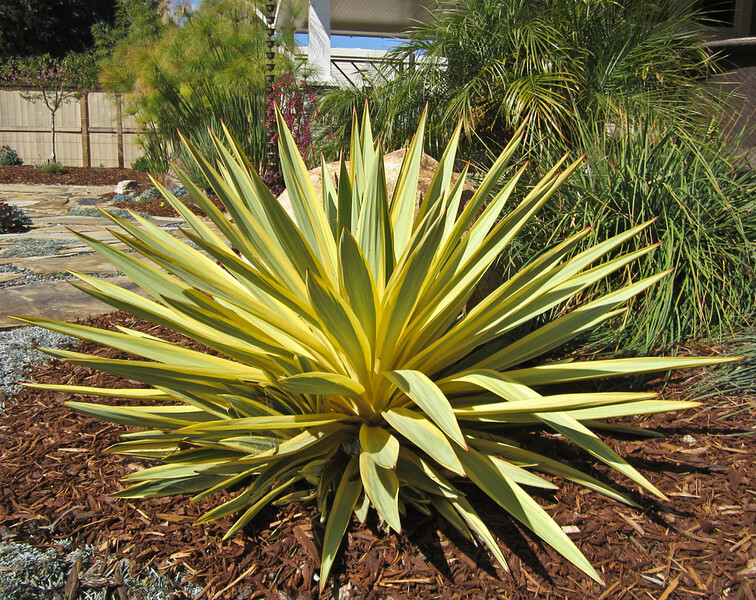 TEJEDA PLANTS FOR SLOPE - Sacred Space Garden Design, Inc.
Yucca Bright Star (Bright Star Yucca) - this brightly colored yucca will make a dramatic addition to the landscape. Slowly forms bold rosettes of broad green leaves with bright yellow edges. 18 inch tall by 3 feet wide. The strappy leaves curve gracefully downward, ending with sharp tips. Over time, a short, broad, trunk-like base develops, giving mature plants a tree-like appearance. Each rosette produces a long branched flower stalk with deep pink buds, opening to fragrant, soft pink bell-shaped flowers, followed by brown seed capsules. An ideal selection for large sunny borders and foundations with well-drained, average to poor-nutrient soils. Evergreen. Hardy to 0 degrees F.